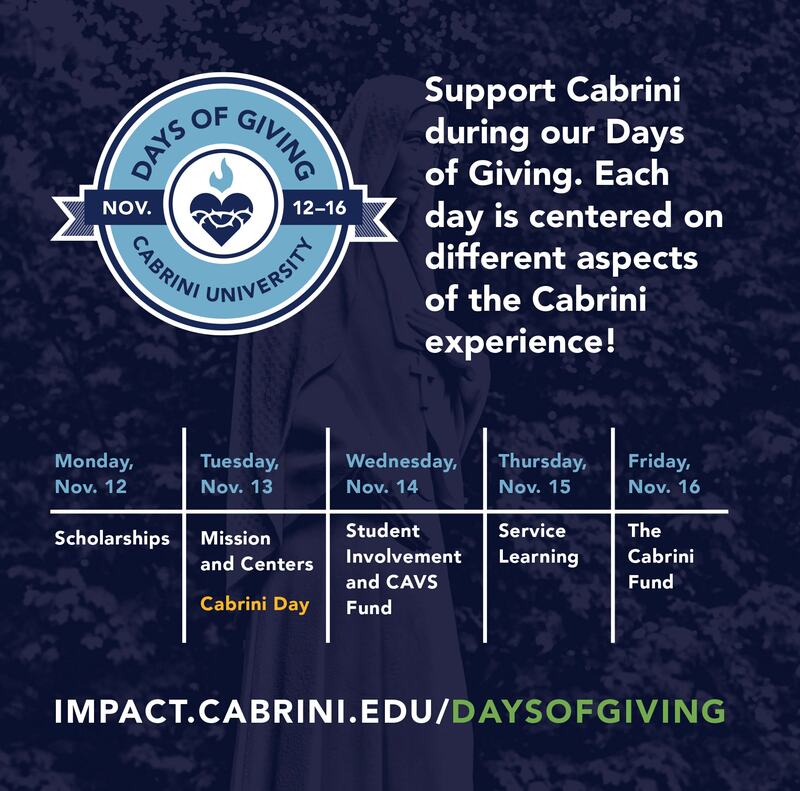 Days of Giving 2018, a 5-day campaign, is aimed at supporting the Cabrini University student experience. Each day throughout the week, will focus on key aspects associated with a Cabrini University education. How will you support our students this week? A gift made during the Cabrini Days of Giving will benefit our students. Alumni, faculty and friends make a difference! Each day is designed to celebrate the many aspects that make Cabrini University what it is today. You may designate your donation to any department, scholarship, or fund, today! Give $5 for Cabrini Days of Giving You may designate your gift to any group/department at Cabrini. Give $19.57 for Cabrini Days of Giving You may designate your gift to any group/department at Cabrini. Give $50.00 for Cabrini Days of Giving You may designate your gift to any group/department at Cabrini. Give $75 for Cabrini Days of Giving Receive a copy of REDS: The 2nd Greatest Generation signed by Dr. Joseph Romano You may designate your gift to any group/department at Cabrini. Give $100 for Cabrini Days of Giving You may designate your gift to any group/department at Cabrini. Give $250.00 for Cabrini Days of Giving You may designate your gift to any group/department at Cabrini. Give $500.00 for Cabrini Days of Giving. You may designate your gift to any group/department at Cabrini.